Firstly, here is some good news: Japanese matcha tea is both incredibly healthy and remarkably easy to include as part of a busy lifestyle. Since matcha tea comes in the form of a fine green powder, it is very easy to add to a hot cup of water and can be made wherever your busy travels take you. Japanese Matcha is even faster to brew than loose-leaf green tea, as it is ready to drink after just a few quick whisks. 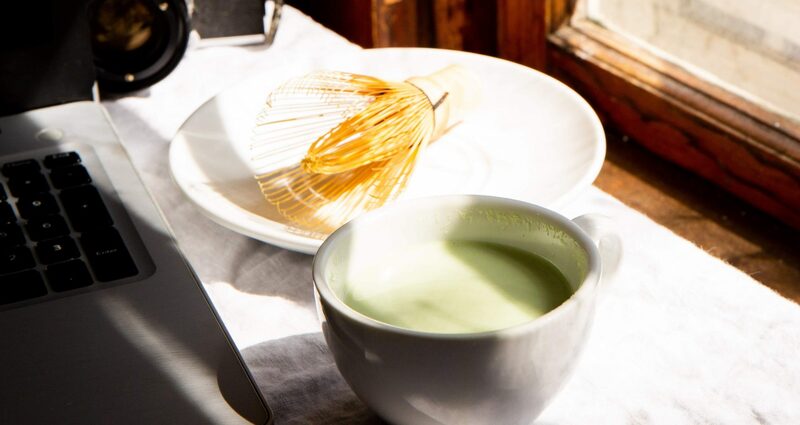 At the beginning of any busy day, you can speed up your morning routine with a cup of matcha tea. Who has time to wait for a new pot of coffee to brew? Matcha tea is at its best when prepared and served with hot, rather than boiling, water, which means there is no need to wait for the kettle to boil and it can be drunk right away. Think of it as a form of powdered, instant tea and for a real breakfast treat, you can even stir in some honey or agave syrup. If you’re used to dashing out the door and taking your breakfast with you during a morning commute, there is no hassle involved with taking matcha tea along for the ride. As long as you’ve packed your organic matcha powder and a thermos of hot water, you’re good to go. In order to get the best flavour and maximum nutritional value out of Japanese matcha tea (which is packed full of antioxidants and catechins), you should always go for ceremonial grade matcha. Ceremonial matcha is the highest grade available, followed by Premium-Grade and Culinary-Grade. Throughout the day, Japanese matcha tea can also be used to provide some helpful hydration. Unlike coffee, matcha tea is actually very helpful when it comes to helping the body remain hydrate. So, at the same time as you are getting a nice restorative sense of calm and focus, you are also revitalizing your body with water. That’s the reason why a lot of business travelers love to pack along their matcha powder with them whenever they’re headed out on a business trip. There’s nothing quite so restorative and calming as a cup of hot matcha at the end of the trip. It’s also a great way to beat jet lag, mostly because it’s so packed with healthy antioxidants that go to work repairing your body. At meals, you can mix things up a bit when it comes to matcha. A lot of foodie bloggers have discovered matcha and they’ve also created a number of wonderful matcha food and drink recipes. For example, you can create a great-tasting matcha green tea lemonade and you can just as easily combine it with avocado to form a very tasty salad dressing. Japanese matcha mixes very well and can even be added to strongly flavour foods like curry. Then, of course, there’s the matcha food beloved by everyone: matcha ice cream. At the end of a long day, of course, you can also brew up some calm, relaxing matcha before you go to bed. The L-theanine found in Japanese matcha will help to generate calming alpha waves in your brain, preparing you for a nice, long night of sleep before your next busy day starts. Matcha, as can be seen, really is for busy people leading a busy lifestyle.